The rule of divide and conquer has been a favorite tool of tyrants whether they are petty dictators or great pretenders. But, a tyrant ascends to power upon the proliferation of confusion, fear and chaos. 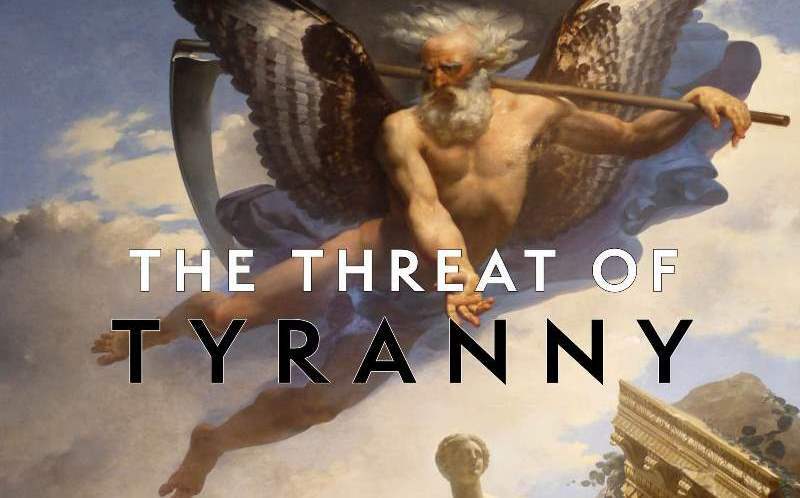 Tyrants know no restraint and break all the rules, while those who enable the rise of tyranny restrain themselves from interceding because common rules and agreements seem to require self-restraint and moderation. Thus, the rise of tyranny depends upon a lack of courage and conviction on the part of those who recognize the threat to common decency and order, but refuse to take a clear stand against it. While the meaning of the word democracy remains a subject of much controversy, as does the practice of it; there is little doubt that democracy stands in opposition to all forms of tyranny. Fear not only causes people to abandon core principles; but it is said to be the parent of cruelty. Long before tyranny comes to rule, there is an escalation of both fear and cruelty. All cruelty comes from weakness and when people become overly fearful they not only support a would be “strong man,” but also become willing to overlook systematic cruelty. Hubris is the term in ancient Greek for the condition of unrestrained pride and self-importance that leads to arrogance and insolence, but can also lead to violence and outrage. Hubris was seen as a human failure to remember the gods; but “titanism” is a form of hubris that happens when humans deny common decency and basic mortality and strive to be seen as gods. The Titans were primitive giants often called “the strainers;” for being full of hubris and presumption they strained to be like the gods. Titans know no laws, observe no limits and follow no natural order. They are mythic figures that parallel tyrants and usurpers on the human level, reckless giants who appear in times of chaos and in periods of cultural disruption and disorder. The condition of titanism leads to excesses of arrogance and desires for power that produce blind ignorance, the destructive rejection of all empathy and increasing brutality. Titanic tendencies include extreme projections of guilt as all failures or weaknesses of those affected must be blamed on everyone and everything except themselves. Thus, the “strong man” who would be ruler must spread falsehoods and escalate fears in order to justify usurping power, breaking all the rules and being above the law. Having no conscious center, Titans can only mimic aspects of genuine life. Having no inherent meaning, they tend to destroy whatever does carry meaning. Wherever Titan energies appear there will be great collateral damage; for in the realm of the Titans nothing is sacred except excess and momentary satisfaction. Titans represent excess for the sake of excess. Bigger, better, greater, one and only, undefeated, unimpeachable, never before seen, huge, and colossal are all Titan-like terms; but also insatiable, lacking soul-fullness and being unable to feel fulfilled and whole, even for a moment. On one hand, Titans are full of themselves; on the other hand they are insatiable, endlessly demanding attention and obedience. Characteristics of titanism often appear during adolescence as young people experience huge appetites, surges of energy, giant mood swings, even spells of brutality and attraction to extreme behaviors. Leaders of mass movements, would be dictators and those seeking celebrity tend to carry these adolescent behaviors and excesses into adult life, where given the opportunity, they act out titanic energies. The bigger they grow the more empty they become inside as enormous pretensions must cover over an increasing inner hollowness. Titanism grows where people refuse psychological shadings, where immaturity passes for passion and where blind excess becomes a cultural value. Those affected by titanism prefer generalizations and fantasies to actual facts and shallow slogans, and empty rhetoric to genuine and articulate speech. Those who support a rising tyrant do not simply make an error of judgment, but also succumb to the allure of lies and fabrications as well as the manufacture of mass confusion. When the highly presumptive nominee states that: “We’re going to have to do things that we never did before. And some people are going to be upset about it… certain things will be done that we never thought would happen in this country…” he is preparing the ground for tyranny and usurping powers that not only diminish democracy, but also defile human decency and dignity. The real “binary choice” is between tyranny and democracy. There are times when casting a vote must mean more than the “formal expression of a wish or choice for a proposal or candidate.” Vote comes from roots that mean "a vow or promise to a god, a solemn pledge." There are times when it becomes necessary to vote for the genuine dream of democracy, for the freedom to struggle against tyranny in all its forms. It is exactly in times of great trouble and fear that the ideals of humanity must be remembered and held dear, while meaning and truth are struggled for in the external world. The dream of America was never simply an economic enterprise, never only a search for greater personal aggrandizement. America has always been a dream needing to be renewed and re-imagined by each generation. The seeds of the dream have always included longings for opportunity, but also a desire for a living sense of justice for all, that includes genuine care for those less fortunate and mercy for those orphaned by fate, hampered by illness, wounded by war or trapped in poverty and oppression. There has always been a deeper dream of America, not simply the political notion of a union of states, but an intuition of a deeper unity of life. Not simply a chance to win an election; but an opportunity to dream America forward and sacrifice for a future of renewed meaning and universal ideals. Freedom is a dream ever trying to awaken in each young heart; but also trying to re-awaken in the hearts of those old enough to know better than to fall for the rhetoric of fear, the tyranny of ignorance and the politics of division.